In another virtuoso re-invention of the still life, Stephen Rose turns to artists such as Louise Moillon, Chardin and Melendez. The simplest and most basic composition of fruit in a humble basket or bowl, placed on a bare shelf without background or fully-realized space, is brought triumphantly up-to-date with this beautifully-painted battered foil box. 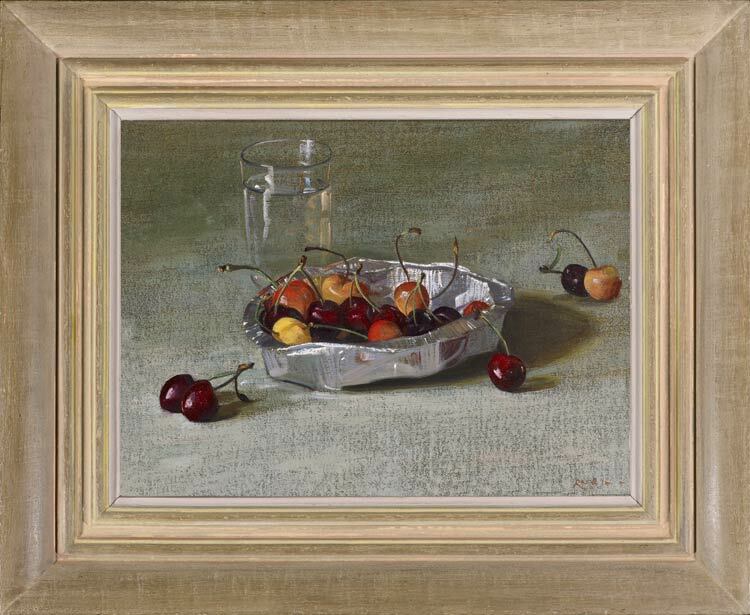 A restricted range of tones for the graduated, mouse-grey ground gains texture and interest from an application of thick paint drawn over the tooth of the canvas; against this subtle background the minimal lines of the glass sing with a plangent harmony, throwing back the golden hues of the cherries. Rose is the master of cherry-painting, and this is one of his finest images.